275 Paracord 3/32 inch There are 124 products. Pink Camo 275 Paracord is Pink, black, gray, and white(Nylon/Nylon). Made in USA. 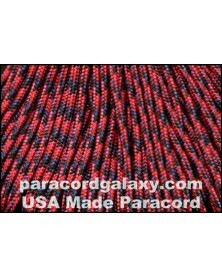 Liberty 275 Paracord is red, white, and blue (Nylon/Nylon). Made in USA. Checker Board/ Red Camo 275 Paracord is red, white and, black (Polyester/Nylon). Made in USA. Gray Light 275 Paracord (Polyester/Nylon). Made in USA. Purple 275 Paracord (Polyester/Nylon). Made in USA. Desert Storm 275 paracord is tan, black, and brown (Nylon/Nylon). Made in USA. Olive 275 Paracord (Polyester/Nylon). Made in USA. Dark Stripes 275 Paracord is black with rainbow color stripes (Polyester/Nylon). Made in USA. White 275 Paracord (Polyester/Nylon). Made in USA. Candy Snake 275 Paracord is pink, purple and black (Polyester/Nylon). Made in USA. 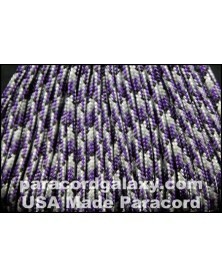 Plasma Purple 275 Paracord is gray, purple and black (Polyester/Nylon). Made in USA. Flag USA 275 Paracord (Polyester/Nylon). Made in USA. Denim 275 Paracord (Polyester/Nylon). Made in USA. Chocolate 275 Paracord (Polyester/Nylon). Made in USA. Reflective Black 275 Paracord (Polyester/Nylon). Made in USA. Reflective Red 275 Paracord (Polyester/Nylon). Made in USA. 3x100 ft of 275 paracord . Colors Red, White and Blue (Nylon/Nylon). 3 pieces. Made in USA. *Please note these packs only count as one cord toward free buckles and flat rate shipping. Aloha 275 Paracord is Purple, Pink and White (Nylon/Nylon). Made in USA. Tan 275 paracord (Nylon/Nylon). Made in USA.